Pricing a job can be difficult. Here are some pricing questions that may help. When pricing a job, especially when the job is large and multiple bids are being sought, can be challenging. Many factors must be thought through. While profit is the bottom line, job pricing is not all about profit if you want to get the job. Here is one question I got in that may be of some help for large jobs. "I have been asked to put in a bid for a neighborhood that has 21 yards to mow. The HOA requires them all to be mowed, weed eated and blown off by the same company. Most of the yards are small (about 15 to 20 minutes to do all) and the larger yards I would guess 20 to 30 minutes. How would you suggest to price this out?" Thanks for the pricing question. Pricing can be challenging. If done well you can have some good money with an opportunity to get more jobs as word gets out. You have a great opportunity here with a lot of lawns in one location. That cuts down a lot of travel time and can be calculated into the price. If you normally charge, for example, $40 for one lawn, load up and drive 15 minutes to your next location, unload your equipment, then here where bidding is concerned, now you can charge less. In the best case scenario, with the lawns being next to each other, you can mow two or three lawns by the time it would normally take you to mow one lawn, load up the equipment and move to another neighborhood. Time is money. Now with the HOA, should you get the bid, you can do 8 small lawns in 2 hours compared to 3 or 4 lawns where they are scattered around town. You have easily doubled your money for that time. Since you are competing for the job, you may be able to knock a third or a quarter off your bid, if that works for you, and still make more money than normal. As far as a price, pricing questions are tough and it depends on a lot of factors. 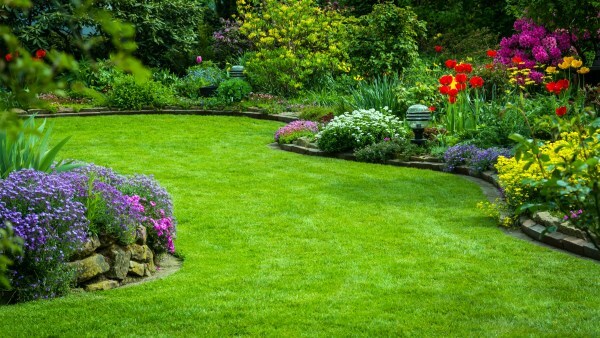 The current going price for a lawn in your area is one. Who your competition is is another and what they charge can be another. If a dozen contractors are bidding, the competition can be steep. If you read my article on establishing a price, keep in mind that some people may be really good at managing their time, may have top quality equipment (which is pricey), if you have a helper, if you are including bagging the grass and if you have a way of quickly disposing of the grass. I knew of a guy who had made his own custom trailer that included a grass bin. His grass catcher was on the back of his Commercial John Deere riding mower and when the catcher was full he backed up the mower unto a trailer, dumped the grass into a metal bin, that was also easily dumped when full (which took most of the day to fill), and was back out on the lawn in only a couple minutes at most. You will have to decide what your costs are and what profit you are willing to accept. I would do some research on your own costs, If you are making payments on your equipment, which are included in costs, examine your competition to see how they are working and how fast they work (at times can be helpful), etc and then decide how long it will take you to do the entire complex, and decide what your price will be. If you have a good, skilled, dependable helper, you can mow while your helper trims the sidewalks and blows the grass on smaller lawns. It cuts your time down in half. If you charge thirty dollars by yourself for a 15 to 20 minute job, you may be able to do it in ten minutes (and still charge the same) with someone helping you. Instead of 3 lawn per hour, you can do maybe 6. If you have two mowers for really big places, while the equipment cost more, both of you can mow at the same time and both trim. If you pay by the hour, say $10 or even $15 for example, and have enough work to supply a helper, you actually make more money than doing it by yourself because you can do twice as many lawns in one day. Keep in mind worker's comp, which can save a lot of money if he got hurt. But if you have enough jobs it can definitely go in your favor. Some people have said that instead of 30 - 40 lawns a week scattered everywhere by yourself, they can possibly do 75 in close proximity to each other with a good, and I stress a "good" helper. If he is not dependable you can find yourself with more work than you can handle alone. Once you get the hang of it, you can bid on huge businesses, etc. I have known people who only do large commercial sites and try to avoid homes. I wish I could tell you more, but much of this you will have to investigate on your own according to your location, etc.